Children at the Neighborhood House Association’s (NHA) New Life Head Start Child Development Center in San Diego will plant fall vegetables and learn the concept of the fall harvest in their own school garden. With the help of a garden grant from Western Growers Foundation (WGF), the child development center was able to plant an edible garden on the playground. The garden will support the innovative curriculum developed through the nationally recognized NHA Nutrition program. Within a year of its' inception, the Gary Knox Elementary School Garden is already positively impacting the students test scores. "Science test results of the fourth-grade students increased 17 percent," said Principal Laura Hurt. Rachael Barkley and Paula Olson, VP of Marketing at Western Growers visited Alice Byre Elementary School to present a $1500 check from Western Growers. Students will be using the funding to expand their small two-bed garden to include more vegetables and fruit. Western Growers Foundation (WGF) is pleased to announce the 2013 Arizona Edible School Garden Grant. This grant is open to all K-12 Arizona schools. Fifty schools will receive $1,500 each to create and sustain their fruit and vegetable gardens. These competitive garden grants will be awarded to schools that can demonstrate how they will use garden-enhanced education to teach students where their food comes from and the important of good nutrition. Northern California may be in the middle of a “river” of storms, but that didn’t stop two state agency representatives from getting out and seeing first-hand what state funds can accomplish. 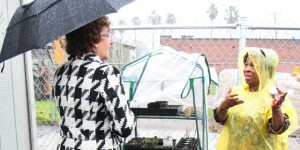 Western Growers Foundation visited school garden grant recipient, Oak Park Preschool in Sacramento, Calif. Wednesday. The school received $1,000 as part of a grant funded by California Department of Food and Agriculture (CDFA). They were one of 100 recipients selected to create and sustain an edible school garden. Power Play’tes, a play off the USDA choose MyPlate.gov and created by Kristan Sheppeard and Susan Sternitzke of Lime Light Creative Group, will be used in every school in Yuma to encourage children to eat more fruits and veggies. Western Growers Foundation is pleased to announce the winners of the 2012 School Garden Grant Cycle.